Two weeks ago my sister and I joined a hike-loving friend in Waterton Canyon. Neither of us had been there. This became obvious when we asked hike-lover, "How far does this trail go?" and she said "All the way to Durango." Durango is in Southwest Colorado. Durango is nowhere near Denver. Waterton Canyon is the eastern starting point for the Colorado Trail. The Colorado Trail is 500 miles and takes, on average, 4-6 weeks to complete. We were definitely only equipped for a casual day hike with our hoodies, tennis shoes and trail mix. Let's just say that we completed the first 3.5 miles of the Colorado Trail (a big 7 miles out and back - not too shabby for a Sunday in early February). 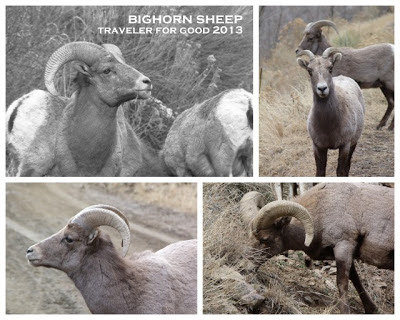 Waterton Canyon is a consistent place to view one of the Colorado wild animal icons, the bighorn sheep. We saw a few sheep up on the cliffs on our hike out. The highlight was when we got to see them up close and personal. On the way back we ran into 15 of them on the trail. A great time to pause, pull out the camera, and enjoy the awesomeness that is life in Colorado. Waterton Canyon is ideal for as much fitness as you want to get. Unless you are hiking all the way to Durango, it's an out and back. Go as far as you want into nature and then turn around and come back.